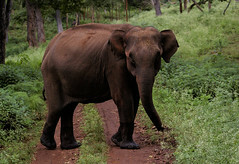 BR Hills Wildlife Sactuary is unique ecological bridge which connects Eastern ghats and Western ghats. It lies in the Chamarajanagar district of Karnataka and shares border with Tamil Nadu. The highest hill in the sancturay is Kattari betta. The famous bandit Veerappan used this forest as his hiding place. The forest is contigous with Sathyamangalam forests in Erode district of Tamil Nadu. The Sanctuary hosts a variety of wild animals with tigers being the prime attraction. Visiting the sanctuary during dawn will be a unique experience. Visit the sanctuary after the rains;typical season is between October to May. Biligiri Rangana Hills is 200km from Bangalore. Route 1: Bangalore - Kanakapura - Malavalli - Kollengala - Yelandur - BR Hills. Route 2: Bangalore - Mysore - Nanjangud - Chamarajanagara - BR Hills.